When the definitive book on Southern soul is written, there will be a chapter on those who should have, but never really made it. It is in this part you will find the name of Big John Hamilton. Had he had the good fortune of recording for Hi Records out of Memphis, or one of the many Atlantic imprints, perhaps things would have been different. Recording for the tiny Minaret label out of Florida failed to get him the national exposure that would have made all the difference in his career. Listening to How Much Can A Man Take (Sundazed), the 18 track collection of all top flight songs and production, only confirms this. The title song, "How Much Can A Man Take," could very well have come from Otis Redding. In fact, that is who comes to mind when first hearing this track. This is not to say that this album is a copy cat of other people's music, and even though there are fine cover versions of the late Freddy Fender's "Before The Next Teardrop Falls" and the Cookie & The Cupcakes New Orleans classic "Breaking Up is Hard To Do," Hamilton has a way of making them his own. There are even two straight blues tunes adding a bit of diversity to this collection. Those tracks, "The Train" and "Lift Me Up," would not be out of place on a pure blues program. Another find is Hamilton's answer song to Johnny Taylor's "Jody Got Your Girl and Gone," titled "I Finally Caught Up With Jody." He also recorded some fine duets with Doris Allen which will appear in a different release. 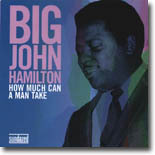 To further clarify how unknown Big John was, it is thought that the two photos that appear on the booklet cover and in the booklet are the only commercial photos to exist of him. Quoting just a bit from the fine liner notes by Jeff Jarema, "The Minaret recordings of Big John Hamilton encompasses a variety of styles; from deep soul and country blues, to gritty funk and sweet soul. The cliche of an artist being too versatile, to the detriment of establishing an identifiable sound might apply here but for the fact that this material is so uniformly excellent." Kudos to Sundazed for making this classic performer's lifetime work available to everyone, and in absolutely state of the art sound. Truly a labor of love. 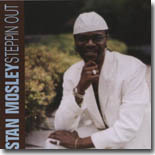 I was quite familiar with Stan Mosley's music as I had reviewed his first Malaco record for Blues Bytes in our October 2000 issue, so I went back to re-read it and was quite saddened by what I read. The review read; "With the passing of Johnnie Taylor there will be a tremendous void at Malaco Records. Sure they still have Tyrone Davis, Little Milton and Bobby Bland ......". Well as we all know Tyrone and Milton are both gone, and an aging Bobby Bland's career has slowed to a crawl. I mentioned at the time that Stan Mosley should be an heir to the Johnnie Taylor throne at Malaco, but after three releases he was gone. Sort of like facing Randy Johnson in his prime, three fast ones and you're outta there. Why Mosley never made it was a mystery to me until I read in a critic friend of mine's review of this new CD, that "various circumstances not to be discussed here have stunted the growth of his career". Hopefully this will start phase two of his career because he is so very talented. With hints of J.T. and even Bobby Womack at times he should be a front runner among the chitlin' circuit performers. His music is more, to coin a new phrase, sophisticated southern soul than many we find performing today, although even he felt the need to include the obligatory dance floor track so aptly titled "Dance Floor". Although most every track is top notch, it is the lovely ballad "Can We Work It Out?" that I play for folks when time is limited. I might add that three of the ten tracks come from a 1995 EP that Mosley recorded for Butler Records, but that one being so obscure, they will not be duplications for most folks. With what appears to be a new (his own?) label, and his fantastic voice as strong and pure as it ever was, let's wish him the best. It�s easy to get burned out on harmonicas. Aside from both Walters, the two Sonny Boys, and �30s/�40s/�50s harp contemporaries who helped amplify the instrument, succeeding generations of players must either replicate as emotionally as the founding fathers or have cut notable ground to stand out among blues fans. Likewise, we have an advantage today that blues harp forefathers didn�t have: visual imaging, the public sees through album packaging often before hearing the music. 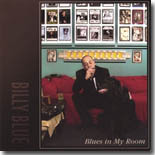 Leader/harmonica man/singer/writer Billy Blue Strauss has done a fair job of both playing and projecting an image to make checking out his album, Blues In My Room, worthwhile. On the minus side, his musical fare and ensemble backing is very much the same polished retro Chicago or west-coast electric style many are overplaying today. On the plus side, his harp chops stand out on the high side of the frequency spectrum, proving a good player�s personality can be communicated through his instrument. His vocals too are quite good, similar to his playing or vice versa. The cover photo shows him posed seriously, as if warming up a moment before performance (petting his late dog, Wolfie, to whom the album is dedicated). There are gobs of gig posters on the wall and portraits of harmonica heroes. He appears a rather tortured soul, confirmed on the back cover photo by an assortment of accessories, musical and otherwise, collected for his room. Billy came from Long Island but was attracted to Massachusetts blues more than once since his interest began about 1980, first Boston and now Worcester. He�s met and jammed with some famous musicians coming through, gigged with some notable and stable blues New Englanders, and deserves high marks for perseverance and survival while rebuilding bands to keep going. This album is the result of Billy�s exhaustive decade-long study and practice of Little Walter recordings. His core quartet is augmented by piano great Dave Maxwell on three tracks, and a lot of the album�s satisfaction comes from being horn-heavy, with the use of just three. The program contains songs by Walter Horton, Albert King (or Ray Charles, take your pick with �Evil Mary Ann�), the Howlin� Wolf and plenty of Little Walter even if it�s through Willie Dixon. Medium tempo is prevalent with great acoustic bass throughout. �Sugar Sweet� conjures up Muddy Waters and Kim Wilson, basic shuffle and rock beats underlie a mix of vocals and instrumentals. Blues Brothers-type horns punctuate the danceable �Let Me Know.� Original lyrics aren�t the profound makeup of fine literature but are doable, as Billy wrote about half of the 13. �Got To Find My Baby� shuffles just right while Billy doesn�t try to sing like Walter Jacobs. The next original is a torch ballad, another leans to rock as in �60s surf, and very impressive is what sounds like a 24-bar �I Gotta Have You.� Little Walter�s �Don�t Need No Horse� is instrumentally like �Roller Coaster,� starting in straight 2/4 in want of a train rhythm the instant the stand-up bass provides. It�s Walter�s late �40s harp playing over his band backing of the mid �50s. The concluding �Falling In Love With You� by Strauss stays in the listener�s head after the album ends. Grade of B+ for musicianship, skill and individuality, a little less for blues style, originality and repertoire. For those that don�t live in, or know, England you might be surprised to learn that there is a thriving blues scene there. Essex is the county to the East of London, and south part of the county borders the estuary of the River Thames (hence Essex Delta). Southend, Essex is the town on the edge of the estuary where it meets the north sea, and it�s the home of Dr.Feelgood, the R&B band that started way back in the 1970s. 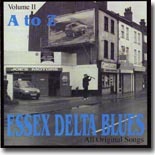 Essex Delta Blues Vol 2 (Bad Moon Records) has just reached me and there are some very good bands/tracks featured on it. 13 all original tracks by 13 different bands of varying talent, and a great listen. The quality of the tracks differs, musically, but there are some real gems here � and bands that deserve a much wider recognition. The main one of these is a band called 3 AM with vocalist Helen Turner. This is one very tight band and Helen Turner has probably the best blues voice in the UK at this time � to my mind she could hold her own Worldwide. The rest of the band, Time Renton & Iain Black (guitars), Trevor Turley (bass), Andy Renton (drums) & Chris Parren on keyboards, are well accomplished and give Helen the backup that she deserves � I�d really like to hear a lot more of them! The track on this CD, �Sister Sunshine�, is an excellent medium tempo blues with plenty of opportunity for the different musicians to shine � if this is representative of the band, then they should have an album out!! The following track on the CD ,"Muso Blues," is by a band called The Untouchables, and again this is a band that deserves more exposure. It�s difficult to give a complete review on a compilation CD without going into detail on every track � and that makes the review heavy going. Suffice it to say, that there really isn�t a bad track on the CD � some aren�t altogether to my taste, but that doesn�t make them bad tracks. Apart from the bands already mentioned, Bad Town Blues also deserve a mention, as do the & The Heaters. If you get your hands on this CD, you won�t be disappointed & you�ll have a good insight into the UK blues scene � give it a listen!!! Here's a new CD full of original blues tracks, recorded in California (in 2006) by a Dane named Peter Nande. Now there�s a mix! The album is called Big Boy Boogie (Straight Shooter Records) and it is subtitled California Sessions Vol. 1 � hopefully this could mean a volume 2 is lurking somewhere. Nande is well known on the European blues scene, particularly in Scandinavia and of course in his home country of Denmark, having been a harmonica player since the early 1990s. With his old band, Nande & The Big Difference, he backed a lot of great US musicians when they were touring Europe � people like Lazy Lester, RJ Mischo & Gary Primich � so he built up an exceptional feeling for the blues from authentic musicians. I think this is the best thing that he has produced so far, and it�s made even more special by the fact that he wrote, or co-wrote, every track on the album. He was helped in his mission to create a new album by James Harman & Nathan James, who recorded the album in his home studio. The album opens with �Cat Be Gone� � an instrumental with the harp way out front. It�s a nice medium tempo introduction to the album and gets the listener�s feet tapping straight away � it put me in mind of some old Walter Shaky Horton numbers. The first vocal track follows, and slows the tempo down just a little � �I Need A Woman� showcases some good guitar work from a couple of the musicians rounded up to help, Nathan James (recording engineer etc etc), and Ronni Busack-Boysen, a Danish friend of Nande�s. The tempo picks up to a medium shuffle beat with �Mover & Shaker,� which features some excellent piano work by Carl Sonny Leyland contrasting nicely with the guitar work of Ronni Busack-Boysen. Throughout the album the tempo changes, the style changes and the beat changes � but what doesn�t change is the quality of the music or the musicians. When I got to track seven, �Snollygoster,� I was hooked! This track makes buying this CD worthwhile all on it�s own � a superb instrumental with a great driving beat to it and Busack-Buysen playing a bit of Elmore James inspired guitar! The harmonica really carries the band along, and gives a tremendous insight into just how good Nande�s harp playing is. Ask me to pick a favourite track and I�m stuck between �Snollygoster� and the swampy Louisiana flavoured �Lucky Charm� � I just can�t pick between the two � they are so different, but so good. Buy the CD and listen to some authentic Danish blues!! 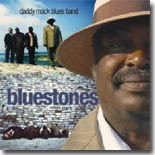 The Daddy Mack Blues Band struck gold early in 2006 with Slow Ride, their album of rock standards infused with a heavy dose of Memphis blues that received a lot of notice. Striking while the iron is still hot, the band has returned to basics with their just-released Bluestones (Inside Sounds). Daddy Mack Orr and the band specialize in a blues/soul/R&B fusion that rarely strays from their Memphis roots. Bluestones sticks to that formula, with some dandy original tunes like rhythm guitarist James Bonner�s �Plain Man� and �Stop Givin� My Love Away� and �Royal Shade of Blues,� from album executive producer Eddie Dattel and Sandy Carroll. The covers range from a loping version of �Shade Tree Mechanic,� an upbeat �It�s Gonna Be A Good Day,� and a spooky take on the Booker T. instrumental �Slim Jenkin�s Joint.� Unfortunately, Orr is in over his head vocally (as are a lot of other singers) on the Sam Cooke classic, �That�s Where It�s At,� and the closing �bonus� track is a peculiar acoustic snippet of Jose Feliciano�s �Feliz Navidad,� that was probably done as a hoot. Orr�s gruff and ready vocals are tailor-made for the juke joint and his fretwork is lithe, but razor-sharp. His band (James Bonner on rhythm guitar, Harold Bonner on bass, and William Faulkner on drums, along with Charlie Wood on keyboards) is tight and in the pocket and never disappoints. Bluestones is another winner from Daddy Mack Orr.